The Lamb Chops were from The Smokehouse of the Catskills. The Mushrooms from Wilbank Mushroom Farm. The Mint from our Garden. Put them all together and you have dinner. Marinating the uncooked Lamb Chops in a dilution of Pomegranate Molasses and water adds to their flavor as well as providing attractive grill marks to the meat. Years ago I learned about the benefit of combining Pomegranate Molasses with Lamb Chops. I highly recommended this as a marinade, and be sure to dilute it, as in full strength it’s extremely rich and thick. The Mushrooms were simply sauteed in EVOO and Butter. 1. Whisk together the Pomegranate Molasses & Water. with the diluted Pomegranate Molasses. 3. Marinate for 1 hour or as long as overnight in the fridge. 4. Heat a grill pan to high, add a TB of Olive Oil & add the chops. 5. Grill for 1-1/2 minutes & turn diagonally for another 1 minute. Turn the chops & repeat. The Lamb will have cooked for a total of 5 minutes. It will be charred on the outside & pink in the middle, as it should be. As an alternative to good old Basil Pesto, give Mint a try. It even works in combination with Basil. As you know the flavor of Mint in conjuction with other herbs add brightness. There are 25 types of Mint. Any one of the available types works. Here is the version used in last evening’s dinner. 1. Combine the first 6 ingredients in a food processor. Using the on/off button process until the mixture is smooth. 2. Add the Mint Leaves & the Lemon Juice, process until smooth. Stop occasionally to scrape down the sides of the bowl. 3. Add the EVOO gradually & process until the Mint Pesto is creamy & smooth. 1. Stem the Shiitakes & slice the Oysters. 2. Heat a saute pan to high, & add the Garlic. 3. 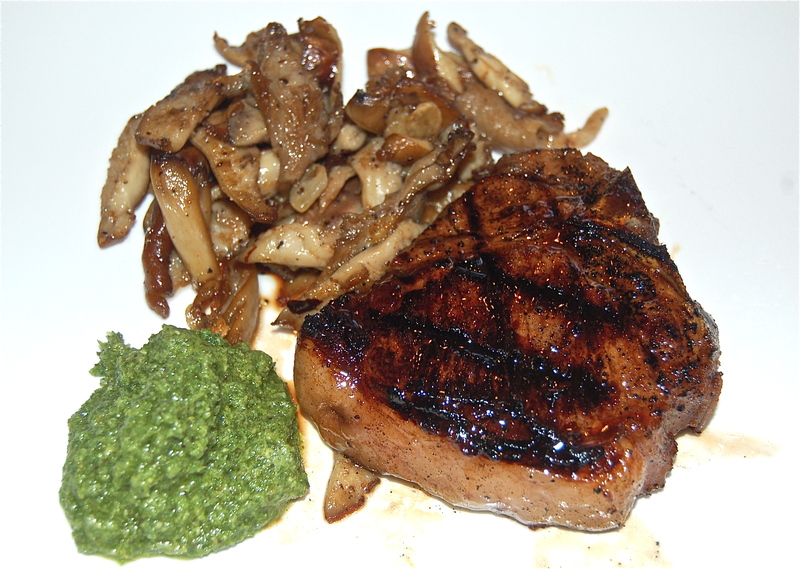 Add the Mushrooms & saute until lightly browned, & look ready to serve. They will be delicious.